Transparency Market Research, in its latest research report states, the global styrene butadiene rubber (SBR) market will grow at a CAGR of 5.7% in terms of volume from 2012 to 2018. This market was valued at 4,600 kilo tons in 2011, and is expected to reach 6,754.8 kilo tons by 2018. This growth is estimated to be at CAGR of 5.0% from 2012 to 2018. 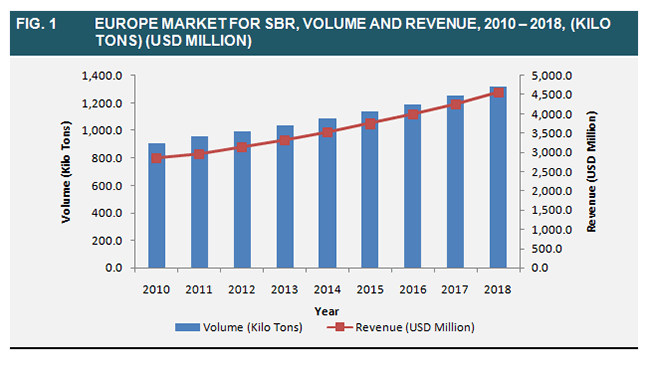 In terms of revenue, styrene butadiene market was valued at $1.3 billion in 2011, and is expected reach $18.9 billion by 2018, growing at a CAGR of 7.1% from 2012 to 2018. The report titled, “Styrene Butadiene Rubber (E-SBR And S-SBR) Market - Global Industry Analysis, Size, Share, Growth And Forecast 2012 – 2018”, is available for sale on the company’s website. The growth experienced by styrene butadiene rubber market is fueled by many factors. Tire manufacturing industry is the biggest factor contributing to this industry. Increase in automobile sale across the globe has led to a rise in demand of tires. The tire industry alone constitutes about 75% of SBR’s market share, both, in terms of demand and consumption. Styrene butadiene rubber is the most commonly used form of rubber. It accounts for 45% of global consumption. Growing footwear industry at a CAGR of 6.4% and construction industry at a CAGR of 6.0% from 2012 to 2018 are expected to give an additional impetus to the market. Despite such strong market drivers, the market does face its set restraints. Volatile pricing of the raw material, especially butadiene, is a huge challenge for the styrene butadiene market to overcome. The factors further complicating the situation are limited supply of natural rubber and regional constraints on production. This however, has created a significant cross-over opportunity for SBR market. In the coming five years, the demand will shift towards E-SBR and S-SBR. Analysts also predict, S-SBR demand will outpace the supply in the coming three years. Manufacturers have already started installing and expanding S-SBR plants to gain substantial market share. Asia Pacific holds the biggest market share for styrene butadiene, followed by Europe and North America. According to statistics, Asia Pacific accounted for 45.2% of global demand in 2011, and is estimated to grow at CAGR of 6.6% from 2012 to 2018. It is also one of the market that is promising fastest growth in the coming years. As the automobile industry continues to grow in India and China the demand for tires will remain exponential, thus contributing to SBR’s market share in these regions. The report further analyzes compay profiles of significant industry players such as Synthos S.A, Lanxess, CNPC, Sinopec, Versalis, and Dow Chemical Company.